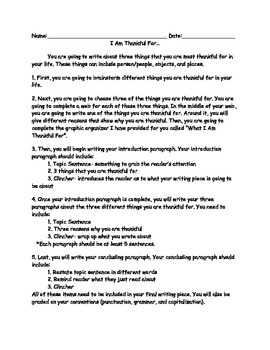 This file includes an outline/steps to follow in order to write the assignment for students to use as a checklist when completing the writing piece. 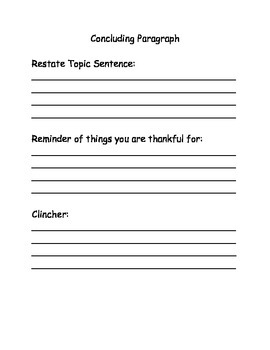 It also includes graphic organizers to write an introduction and concluding paragraph. 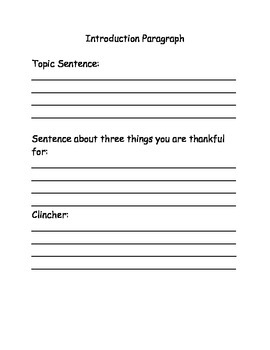 I also included some graphic organizers for each paragraph about the things the students are thankful for. These I only used with some of my students, but it depends on how much writing experience the students have had. In the end, this will be a wonderful five paragraph writing assignment!